Hyper Station is designed to go wherever your music takes you. While sturdy enough to safely hold your laptop and other small electronics, it folds up as one piece and fits in a backpack! 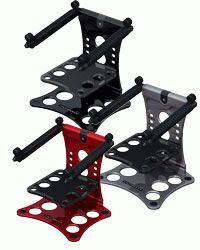 But, don’t let the sleek styling fool you; this is not a flimsy, plastic stand. Hyper Station is constructed from die-cast aluminium making it incredibly sturdy while surprisingly light. The automotive-grade anodized finish is stunning and scratch resistant. The laptop support arms are angle- and depth adjustable. You can place your laptop at whatever angle suits your needs and then secure it in place with the telescoping non-marring arm stops. The modern musician and DJ artist carries additional hard drives, MP3 players, USB hubs, and other computer accessories with them to each and every gig. Hyper Station has you covered! The second tier is height adjustable and fitted with ports for venting and cables.